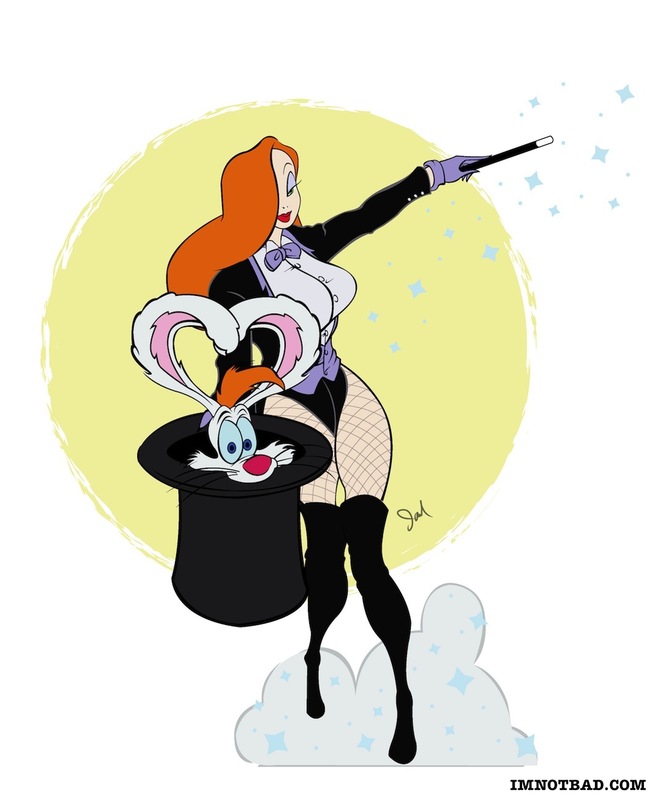 A Jessica Rabbit friend, Mark, wanted his custom figure to be made as a crossover of Jessica and Batman character Zatanna. I'm not very familiar with Zatanna but he sent over some artwork he liked and I remade it with Jessica and Roger. This was sent to Jen Bednarski as a guide as to what he wanted his custom figure to resemble. She expertly recreated it and even added an ACME box of Portable Holes - what a great touch! Roger is the rabbit Jessica is pulling out of her hat, and there are even stars at the end of the wand. She also made a "classic Jessica Rabbit" complete in her sparkling dress and purple gloves. Again, the details are astounding, the colors are vibrant and the attention to the verve of the character all give this figure everything it needs to be a Real Jessica Rabbit creation. These figures use a completely new body shape as the base, and work perfectly for Jessica. After many years of seeing one-of-a-kind pieces, the work by Jen Bednarski always has me floored, and Disney needs to take note. She is up there with the likes of Miss Mindy and Noah. If you haven't seen all the amazing work of Jen Bednarski you can check out her Facebook Page and her Instagram page, which includes work in progress shots of her Jessica Rabbit figures. To check out her Jessica Rabbit Hair Affair Vinylmation, you can see more photos from my post here.